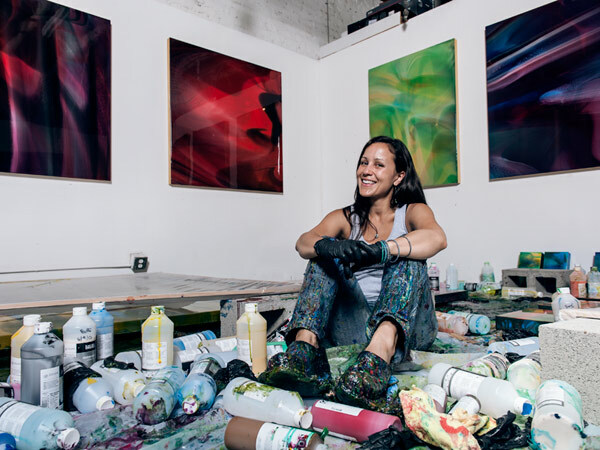 Christina Velázquez is a Mexican-born multimedia artist from East Palo Alto. 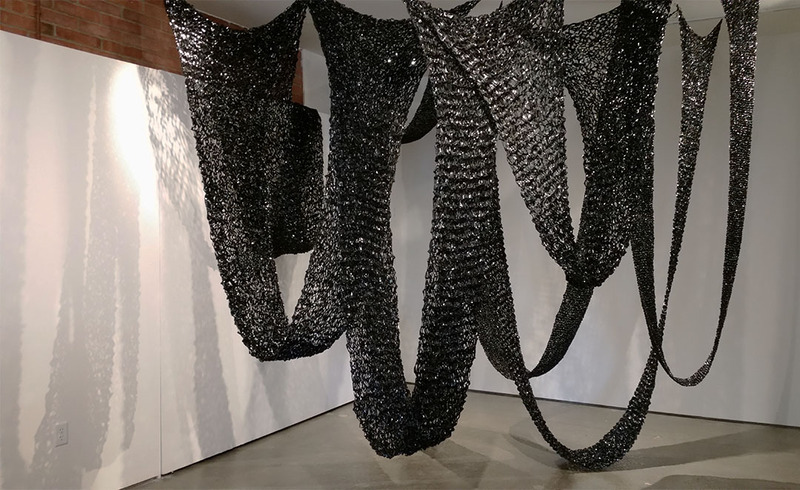 Her installations investigate women’s experiences and have been exhibited across the Bay Area. 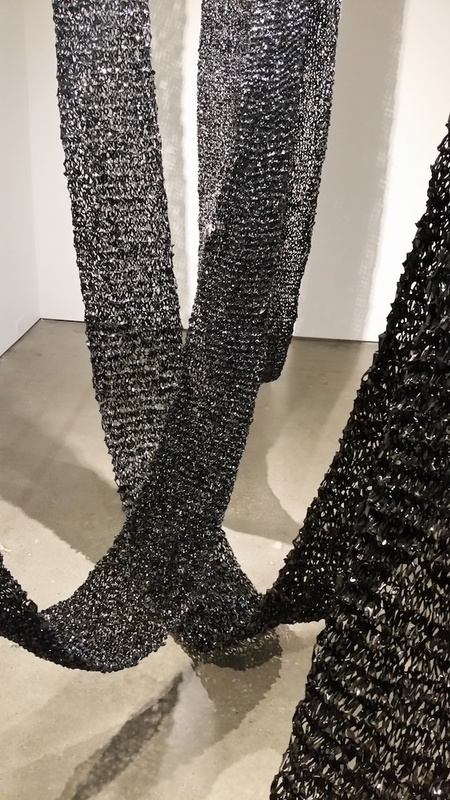 For her new project, Velázquez knits long shawls from VHS tape. 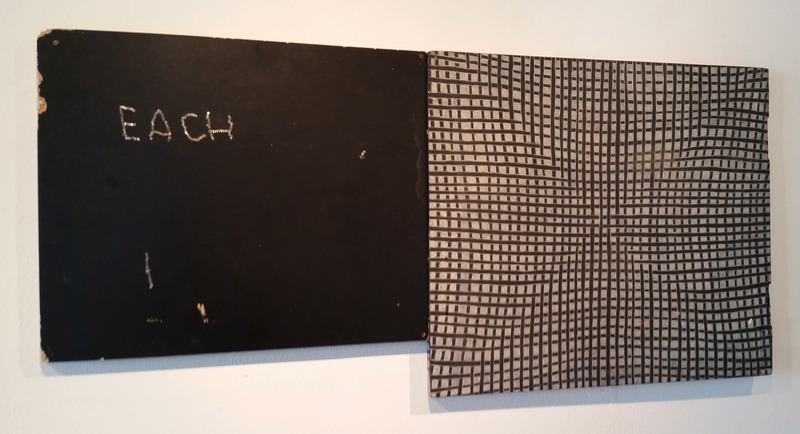 Earlier versions of her knits have been displayed at San Francisco’s Meridian gallery in 2013 and at San Jose’s Arc Art in 2014. 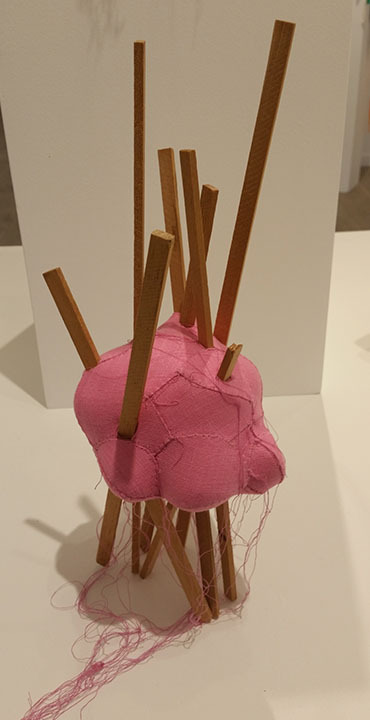 Velázquez recently spent a month in residency at the Palo Alto Art Center, during which she invited the local community to help her knit. 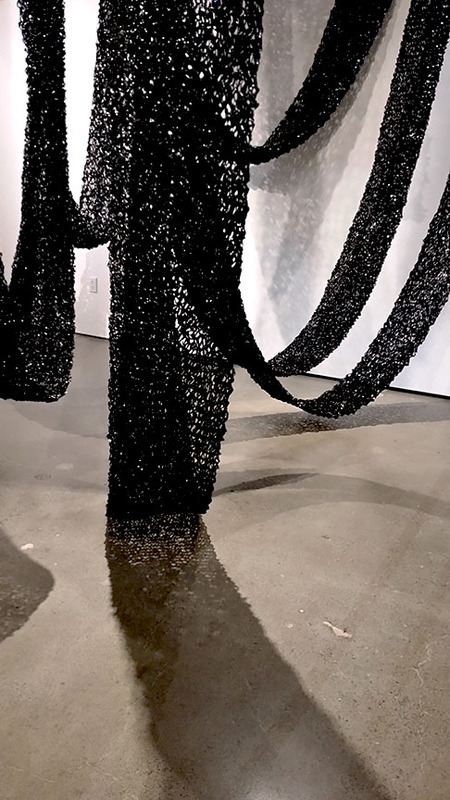 The resulting long shiny black shawl was installed in November 2014 at the Palo Alto Art Center. I spoke to Velázquez recently and a transcript of our conversation is below. It has been edited for clarity and length. Gavish: Conceptually, what motivated you to work with VHS tape? Velázquez: This project of knitting obsolete VHS films is connected to women’s issues and to recycling. The work is about women as part of the community. Through the knitting I wanted to address how, as women we work together to make handwork. While women crochet and knit, important issues transpire from their dialogs. I wanted this project to engage the knitters in conversation about recycling and to become part of a continuation of that dialog. The concept for my work came about when I encountered at the Museum of Quilts in San Jose a knitted piece made of cassette music tapes. That gave me the idea of reprocessing material by knitting. I was thinking about the black shawls that old women wear in the villages of Mexico. These women were older and the knitted shawls were characteristic of their generation. They covered their heads and reminded me of the Virgin Mary. I wanted to make such shawls from VHS films, which used to be so shiny. I wanted to marry in my work the two ideas of the old women and the old VHS films, both at the end of their lives, on their way to the landfill, close to their death. Gavish: How did you learn about knitting film? How is it different from other materials? Velázquez: I had a lot of VHS film in my studio, and I decided to learn how to knit it. I started to learn at the Palo Alto Library where the community members were invited to be part of a knitting circle. For six months we knitted scarves and, as soon as I completed my second scarf, I realized that I was ready to make my oversized scarf from VHS films. These films, which were not intended originally for knitting, became like a lot of my art materials that I push and pull, wanting to get them to behave completely differently from what they were intended for. This process of forcing materials is sometime painful and hurts me physically but I really push these objects to obtain their new application. Gavish: What was the process in which you have worked with the Palo Alto art center collecting the material, organizing the community knitting and finalizing the installation? Velázquez: The residency started when the Palo Alto Art Center sent out a call to the community, asking for donations of used and unwanted VHS tapes. Within hours they received hundreds of old VHS films from residents. The next step was for me to sit and knit a long shawl from these films in the glass gallery and to invite people to join me in the work. My expectations were to create a large shawl that would take up the entire gallery space and to have a lot of people helping with growing the piece quickly. The process turned out to be slower and the piece did not really materialize to the full size that I had envisioned. Still, we had some amazing people with great stories that they shared about their background. Some of them were even professional knitters. Lisa Ellsworth, the Palo Alt Art Center curator, did the installation itself. 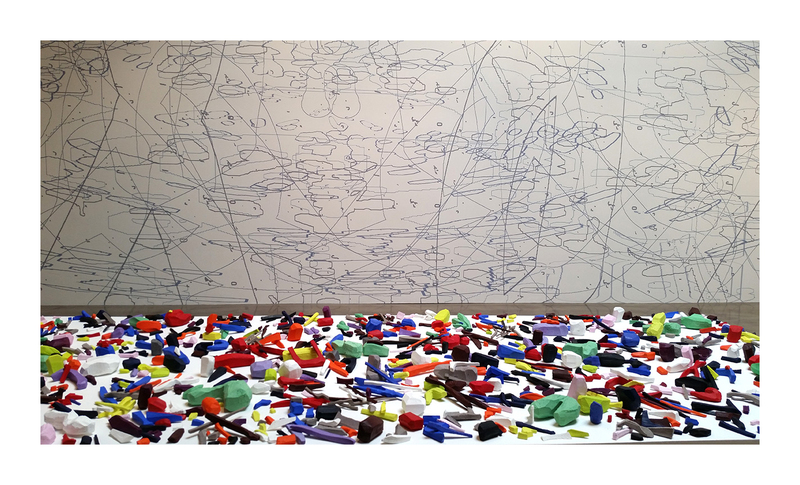 She hung the large piece using plastic filaments and her vision and perspective were very important for me. The only visual points that I had were to have a very large organic shaped oversized drape and to be able to project its shadows on the walls. Those were my only take. Gavish: What are your plans for the future? How do you intend to continue your knitting project? Velázquez: My Palo Alto Art Center residency was an important step for my project because in that space my work finally became a complete installation. Beforehand, I made just one or two smaller pieces. 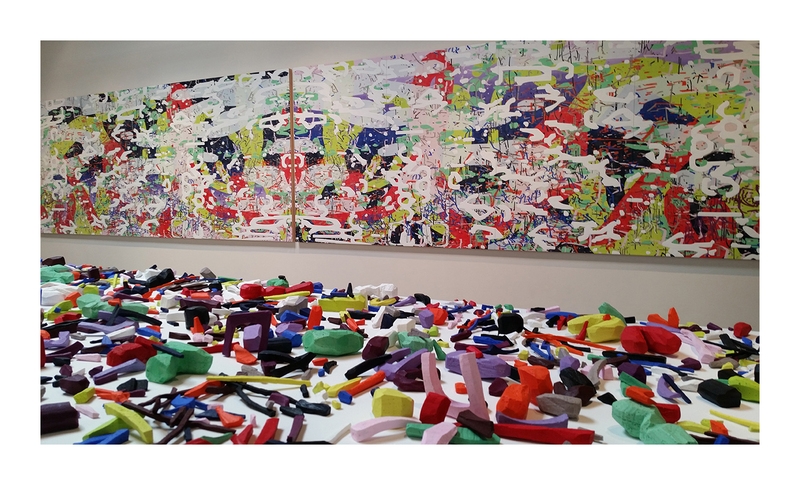 Now it was a large installation that was taking up the exhibition space. For the future, I have in mind a couple of places to apply to continue my project. I plan to work in different galleries and knit more of my films with audience participation. I do hope for it to go on as a community project, where I engage the public in conversations about recycling and about issues connected to women. 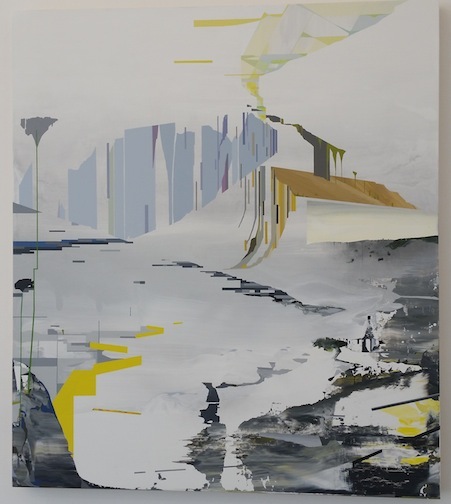 Subsurface Continuum is an exhibition of new works by the San Francisco-based painter William Swanson at Eleanor Harwood Gallery. His new works of abstracted landscapes seem vast although he is painting them on small to medium size canvases. Using economical marks, he conveys images of extended terrains interrupted by urban elements. Swanson layers his seamless painted areas and covers his surfaces with perfectly smooth monochromes. 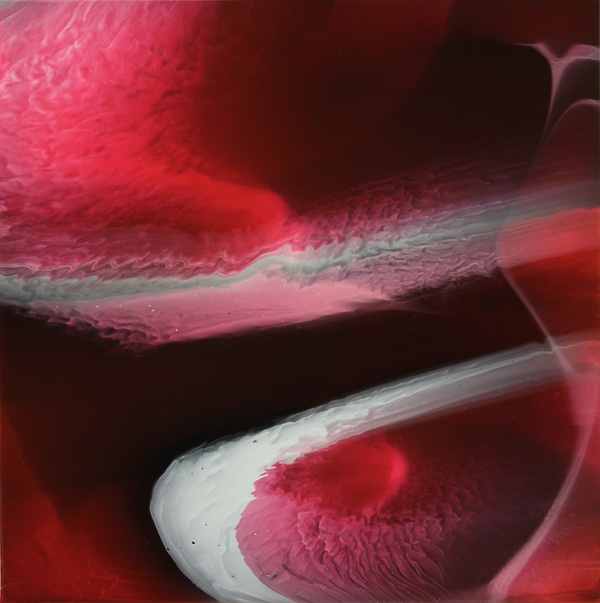 In some cases he extends his technique to reveal his brushstroke patterns, creating color gradients and softening their edges. In the new series Swanson builds his compositions from sharp edged shapes of color, outlining specific landscapes of golden forest silhouettes, dramatic slopes or steep hills. He leaves much of his surfaces unpainted, turning them into foggy and flooded scenes. He then encloses these natural views by architectural geometries, interrupting their organic continuity. His clean style gives an impression of coded landscape design where he assigns a color to each element, mapping events of architectural expansions over natural lands. 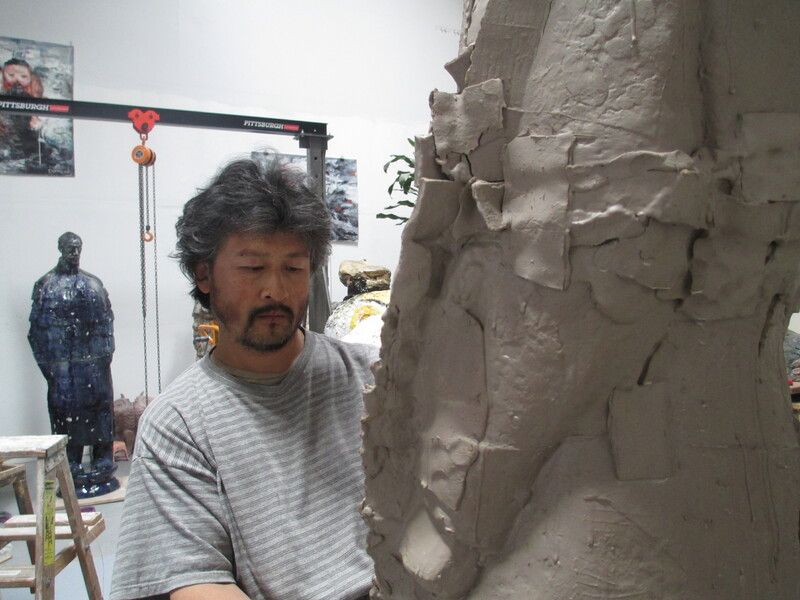 But although his work is so meticulous, it is not lifeless. Swanson creates dramatic tensions in his architectural structures, such as the single lamppost illuminating a flooded road in Terraform Floodplain. In Sunburst Radiant, dark squares are accumulating to block the radiant sunlight from the forest behind it. 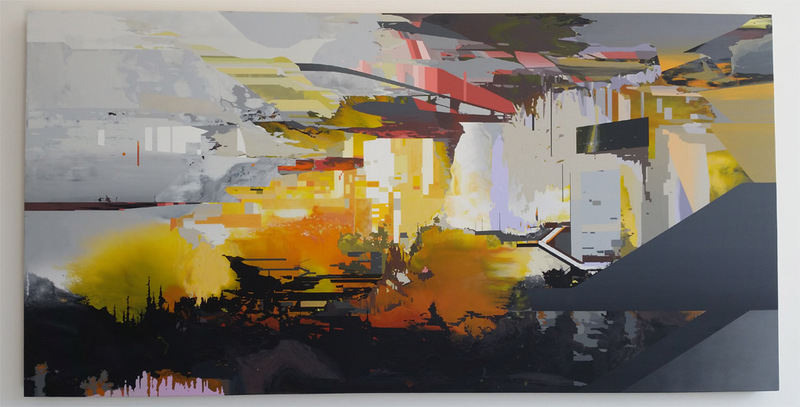 Another example is his painting Luminary Phase, where Swanson constructs a multi-perspective space of excavated urban landscape against a dark backdrop. This futuristic archaeology exposes a series of radiant hi-rise structures flashing fiery light from behind a fractured derelict neighborhood foreground. 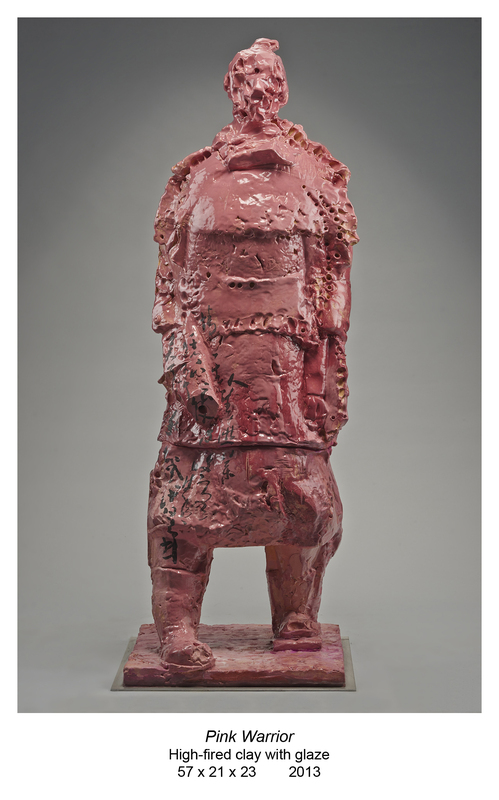 While his work takes a clear environmental stand, its strength is in its abstracted subtlety. Rejecting slogans, Swanson conveys his message by including the menacing urbanization in his peaceful landscapes. 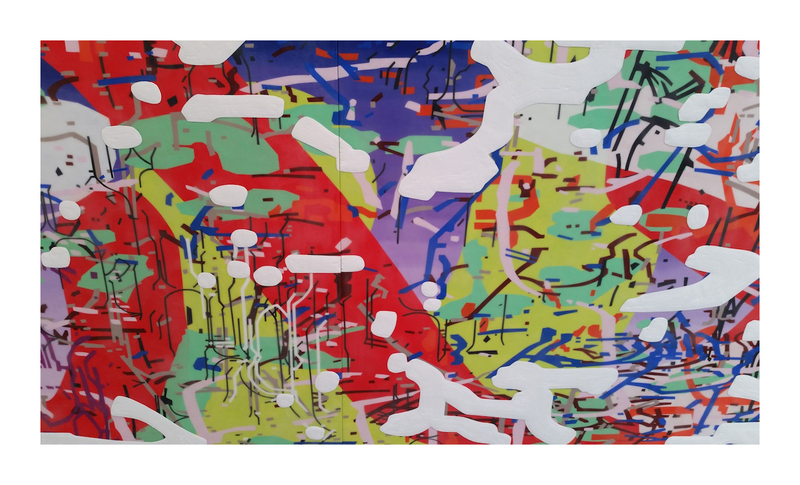 His abstracted shapes create a language that narrates the collision between the geometrical and the organic, leading his viewers to experience their unavoidable collision.The story that Swanson is telling us is not new. He is alerting us to dangers that we are well aware of. Yet the simplicity of his strokes and his concise narratives are effective, when he delivers his important message through elegant quality. His new paintings become part of a long tradition of American landscape painters, whose narrative is currently shifting from romantic calmness to environmental anxiety. 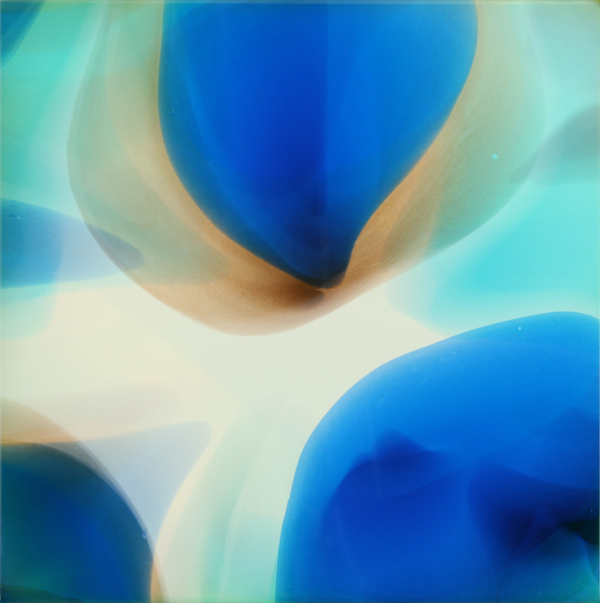 The works in Subsurface Continuum are literal landscapes and abstract compositions at the same time. Swanson allows the two genres to coexist and even gain from each other. By abstracting his paintings he makes his landscapes infinite, while the abstract absorbs a narrative perspective, turning into an ecological prophecy. 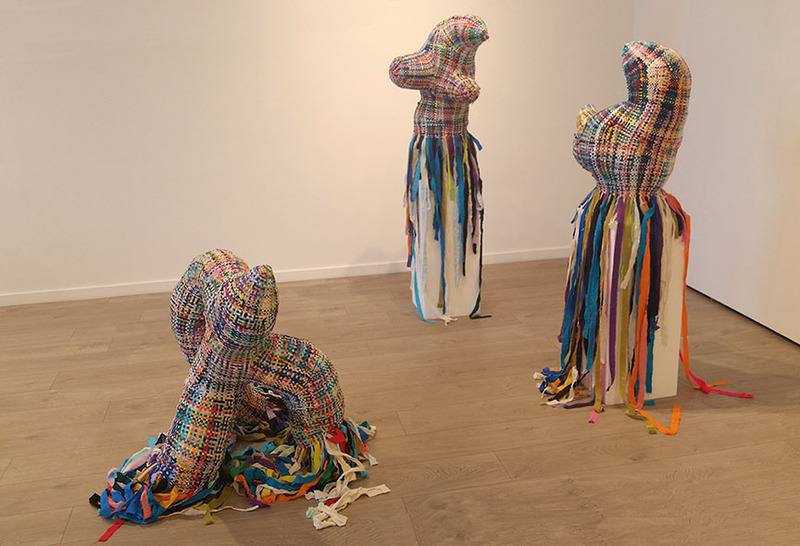 Three skirted cloth sculptures stand in the entrance to the Jack Fischer Gallery in San Francisco. Well-known Bay Area fabric artist Lauren DiCioccio stitches these large stuffed figures from scrap cloth. In an elaborate process she prepares their fabrics out of colorful cloth straps and weaves them into checkered warp-and-woof patterns. She then tailors the woven cloth over an armature and stuffs it with leftover material. The sewn group poses in an intimate setting, gesturing with irregular limbs at one another. They are caricatured but their interactions are personal and touching. In the second part of the show, separated by a dividing wall, the artist arranges long backstage tables with an assortment of stitched variety. 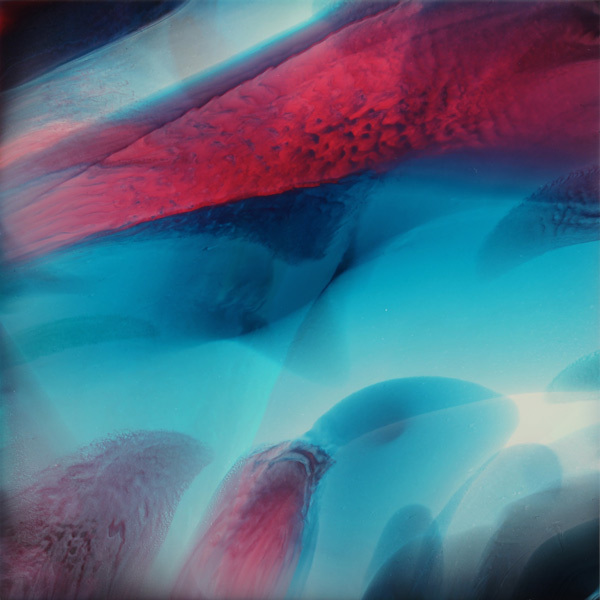 The colorful array displays small creatures of unusual shapes and strange extremities. Their fantastic features create a pseudo-scientific set of exotic breeds. Made of many types of fabrics, some of the figures appear with their armatures exposed, creating strange, exoskeletal species. Others are only partially covered, exposing their gobbled-up cloth innards. DiCioccio does not resolve her shapes. She lets her audience wonder about the nature of her fictional species as their inner and outer surfaces become indistinguishable. The small statues on the tables look like they came out of a toy-box. Their bizarre shapes trigger the imagination: some look like old handmade toys, others invoke extraterrestrial monsters and still others remind of fairytale creatures. This room shows the matter of imagination. It is out of these objects that the artist creates and imagines the scene presented in the entrance. 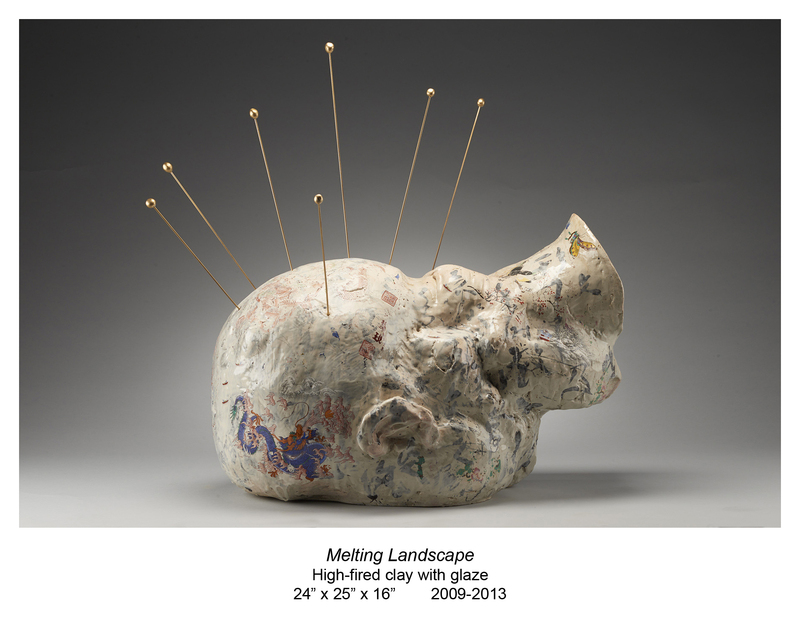 This exhibit provides an opportunity to see DiCioccio extending out of her comfort zone. 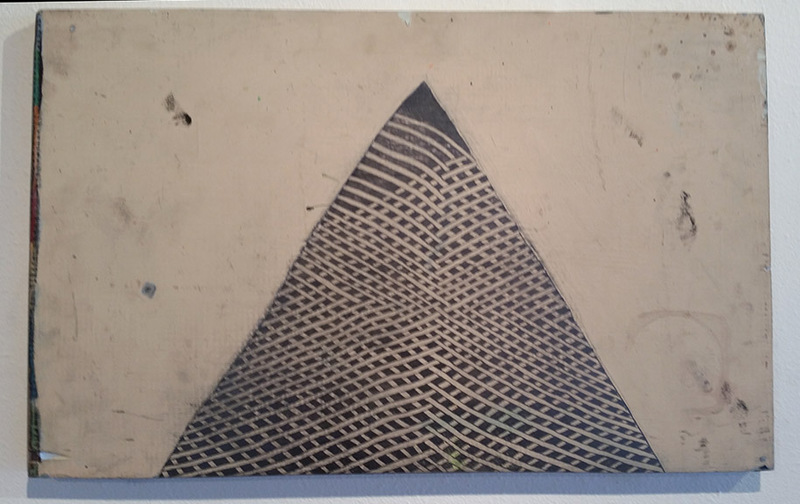 She abandons her objects in favor of figuration and moves from representation to semi-abstraction. 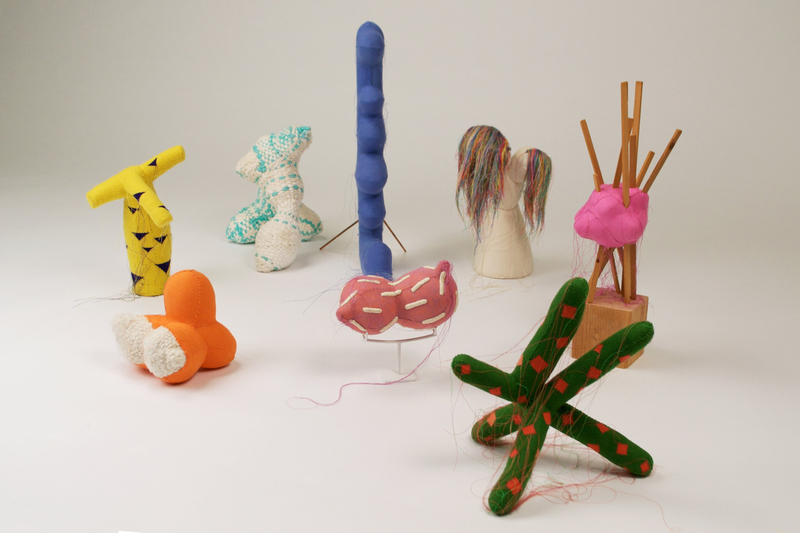 Abdicating her familiar and safe practice of embroidering ready-made objects, she now sews her invented figures from scratch. 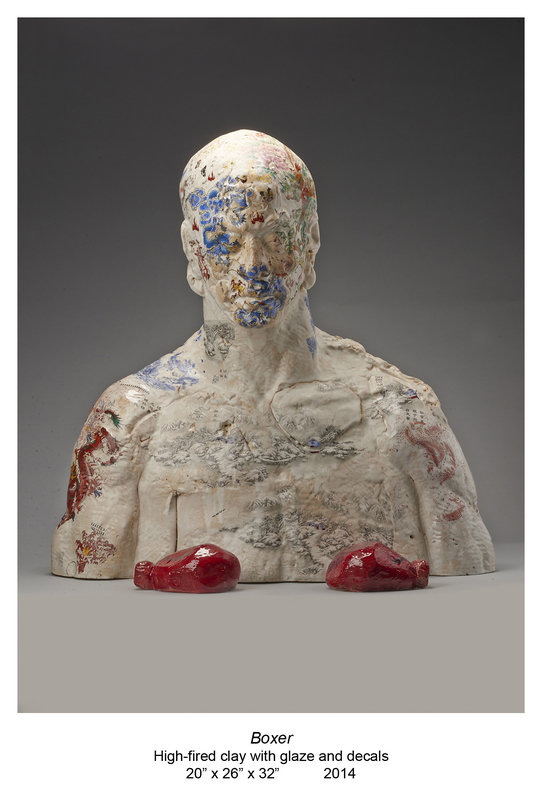 Instead of interpreting she fabricates new figures, shifting her practice to sculpting in cloth.